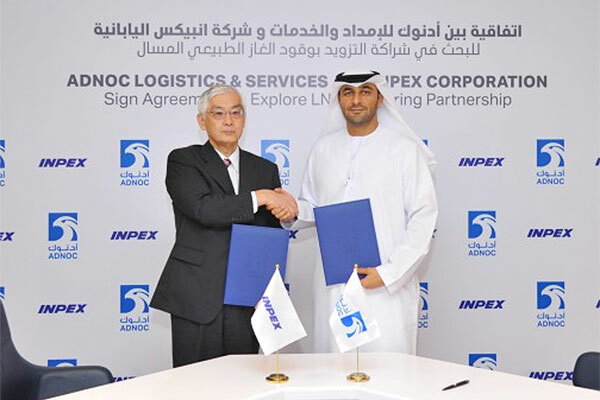 Adnoc Logistics & Services (Adnoc L&S) and Inpex Corporation, a major oil & gas exploration & production company in Japan, have signed a framework agreement for an LNG bunkering partnership in the UAE. Under the agreement, Adnoc L&S, a wholly-owned subsidiary of the Adnoc Group, and Inpex will explore opportunities for LNG bunkering in the UAE as well as the potential to jointly expand LNG bunkering activities to cover other regions, including Southeast Asia, reported Emirates news agency Wam. Captain Al Masabi said: "Adnoc L&S has a long-established history in LNG shipping as well as bunkering operations. Our goal, through this partnership, is to offer safe and efficient LNG fuelling solutions to our customers. With the support of our sister company, Adnoc LNG, as well as our partner, Inpex, we see a significant opportunity to become a major player in the LNG bunker market." Yajima said: "It is our great pleasure to announce that we continue to expand our excellent partnership with Adnoc, building on our long-term relationship in the upstream sector. Adnoc and Inpex share the responsibility, as global energy companies, to provide our customers with a safe and efficient fuel that is compliant to international emissions regulations. "As outlined in Vision 2040, our long-term corporate vision, we will look to develop gas demand in Asia and other growing markets. LNG bunkering will be a key component to the creation of natural gas demand. Inpex aims to become a key player in natural gas development and supply in the Asia and Oceania region during the period until 2040."